Grind is the place where brunch dreams are made. Throw in some totally dreamy interiors, a cracking brunch menu and you've got yourself an instagrammers paradise. Dotted in the key locations in London, you're bound to find one somewhere near you. I headed to London Bridge a couple of weeks ago and went for the baked eggs, washed down with an iced coffee, but I heard they had a little secret. And it might just be the best secret ever. 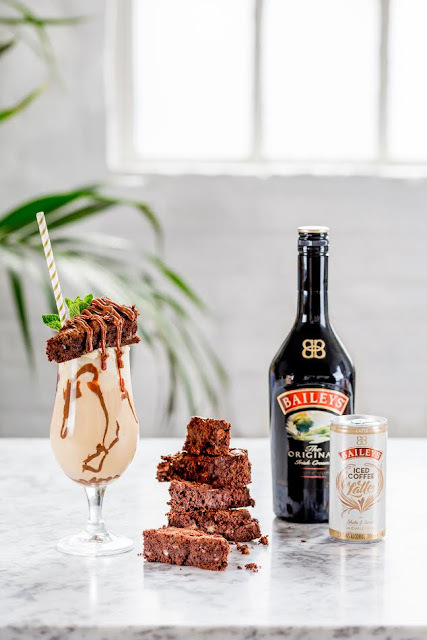 They have teamed up with baking queen, Candice Brown, to give you a Baileys Mint Brownie Iced Latte. No need to think of Baileys as a Christmas tipple anymore, its nailed iced coffees and become a firm summer favourite. These beauties are available for a limited time and all you have to do is whisper "Don't mind if I Baileys" to the barista at Grind and they will whip one right up for you. A special secret that's not on the menu. Trust me, you will like it a latte.